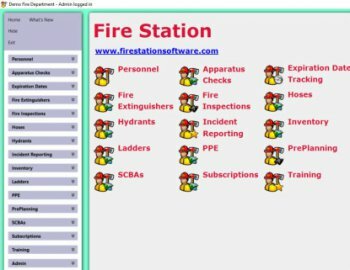 Fire Station is an affordable and easy to use computer program for record keeping at your fire department. If you're tired of shuffling paper and your department is ready to migrate to a computerized records keeping system, Fire Station is an affordable and powerful option. Fire Station provides an efficient way to keep your department's information organized and at your fingertips without breaking your budget. You can customize Fire Station by purchasing only the modules you need. Easily add modules later.